June 30th is Asteroid Day (http://asteroidday.org), which is a global awareness campaign for the hazard caused by asteroid collision to Earth. June 30th is the anniversary of the Tunguska event in Siberia on June 30, 1908. 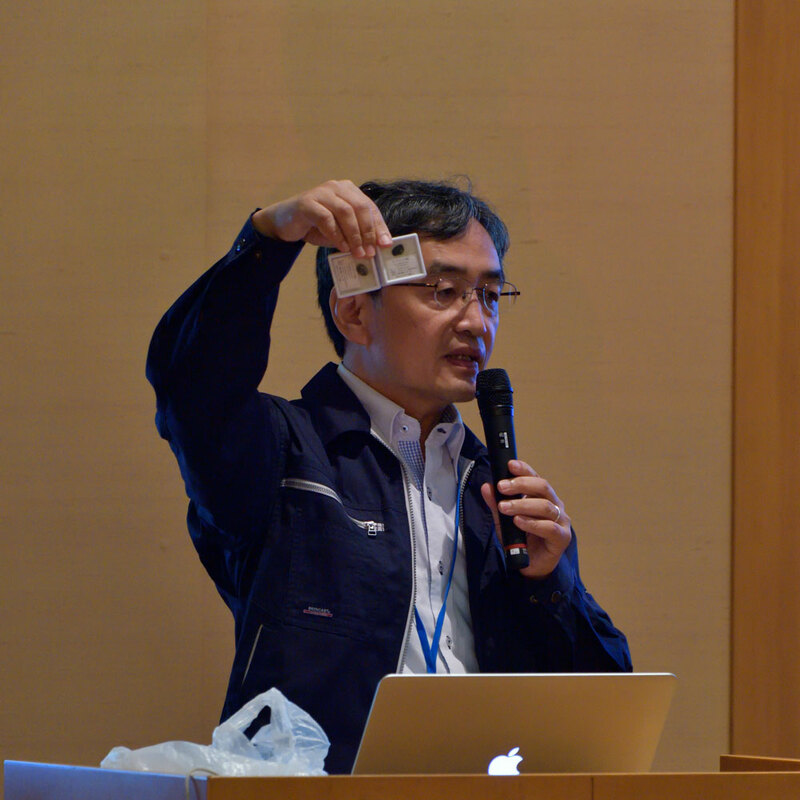 Mr. Grigorij Richters, one of the organizers of Asteroid Day, asked to JAXA to do something related to Asteroid Day. This is the trigger for the event reported here. Hayabusa2 Project holds "Talk Live", a kind of talk show, once in two months. We present various issues related to Hayabusa2 project. 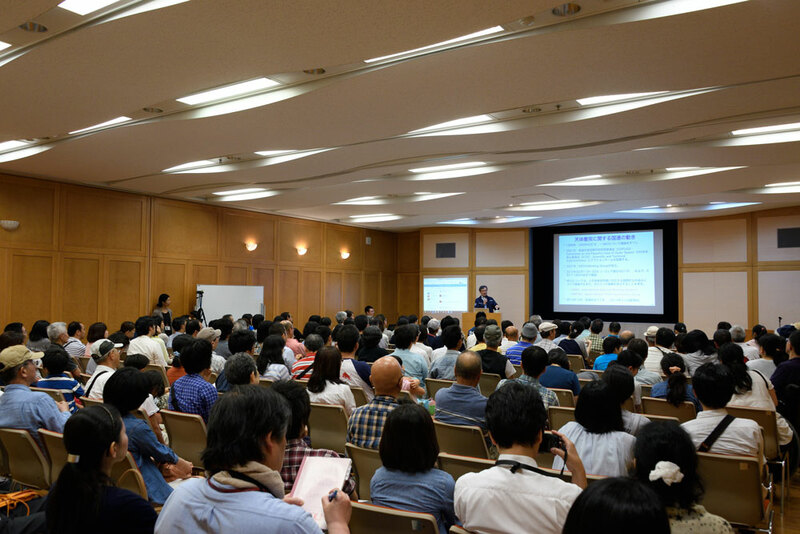 On June 12, 2016, we held the third Talk Live at Sagamihara City Museum. On the same day, we also had some events that celebrated the Earth return of Hayabusa, which was on June 13, 2010. Therefore, the main topic of the Talk Live on this day was set to Spaceguard (Planetary Defense), especially the role of Hayabusa and Hayabusa2 from the point of Spaceguard. About 180 people came to the Talk Live (Fig.1). At first, I explain why we took spaceguard as the topic of today's Talk Live, and then I presented many things related spaceguard, such as, recent impacts to the Earth, NEOs (Near Earth Objects), observations, orbits, mitigations, etc. I also explained the reason why Hayabusa and Hayabusa2 are important for spaceguard. You can see the video of this Talk Live in YouTube (https://youtu.be/BA1rEkmV4fw), although the talk is in Japanese. In this report, I quickly summarize about the role of Hayabusa and Hayabusa2 in the context of spaceguard or planetary defense. 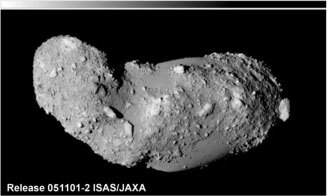 Hayabusa, which was launched in 2003 and returned to Earth in 2010, was the world-fist sample return mission from an asteroid. The target asteroid is (25143) Itokawa, a small S-type asteroid (Fig.2). Itokawa is one of the NEOs. NEAR Shoemaker spacecraft was first to rendezvous with an NEO, Eros. Eros is about 38km in the length and it is not supposed that such a large NEO will collide to Earth in the near future. However, the size of Itokawa is just about 500m, and such object is what we must consider for the planetary defense. After the exploration of Hayabusa, we concluded that the structure of Itokawa was a rubble pile (Fig.3), not the one single block of mass. 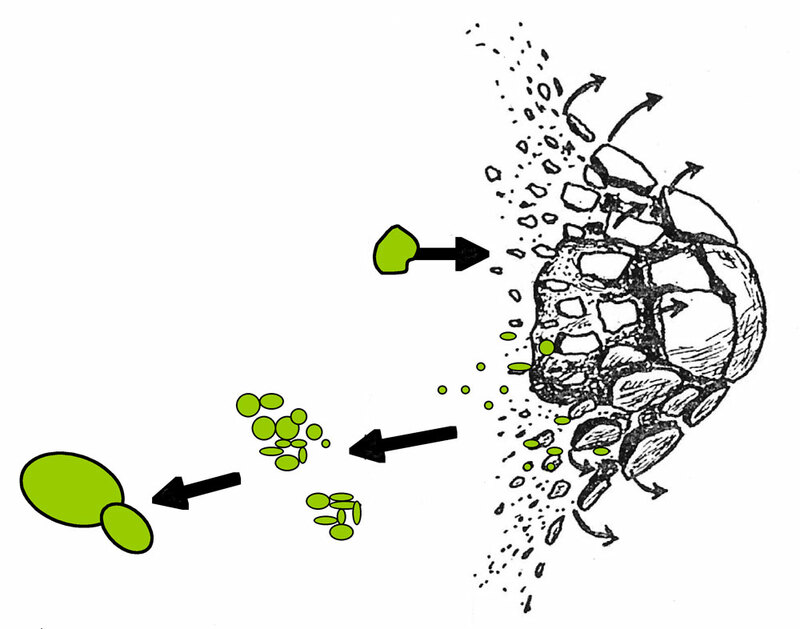 We came to this conclusion not only from its surface feature with numerous boulders but also its density. The estimated density of Itokawa is about 1.9 g/cm3, while the density of the surface material of Itokawa, that is the ordinary chondrite, is about 3.2 g/cm3. If we assume that whole body of Itokawa consists of ordinary chondrite, then the macro-porosity is about 40%. Form this fact, we concluded that Itokawa has the rubble pile structure. This conclusion is very interesting for planetary science, and also it is very important information when we try to deflect an Earth-colliding asteroid like Itokawa. Another interesting attempt for spaceguard in Hayabusa mission is to estimate the landing position of the reentry capsule on Earth. Of course, the landing position was estimated precisely by the radio navigation. However, assuming that Hayabusa was an asteroid that moved along the collision trajectory to Earth, we tried to estimate the landing (or colliding) position by optical observations. Optical observations by the ground-based telescopes were successful in the observatories of Tenaga, Mt. Lemon, Subaru, and CFHT. We got 23 data 10 to 8 hours before the landing. Using only these optical data without the information from the radio navigation, we estimated the landing position of the reentry capsule. 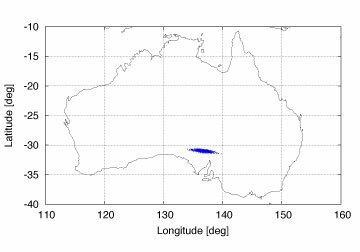 The result was that the landing position was estimated with the error of about 560km (Fig.4). Now let's move on to Hayabusa2. Hayabusa2 is also an asteroid sample return mission. It was launched on December 3, 2014, and now it is on the way to the target asteroid (162173) Ryugu. 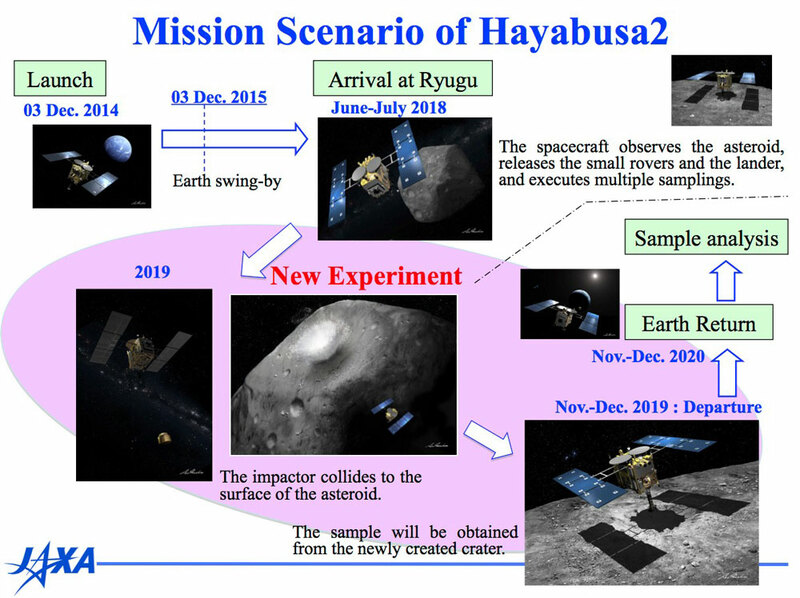 Hayabusa2 will arrive at Ryugu in June - July 2018, and return to the Earth at the end of 2020 (Fig.5). From the point of Spaceguard, the most important role of Hayabusa2 is to reveal the nature of small C-type asteroid. Asteroid Ryugu was selected because it is C-type. The science purpose of Hayabusa2 is to study organic matters and water, which may be in the surface material of Ryugu. 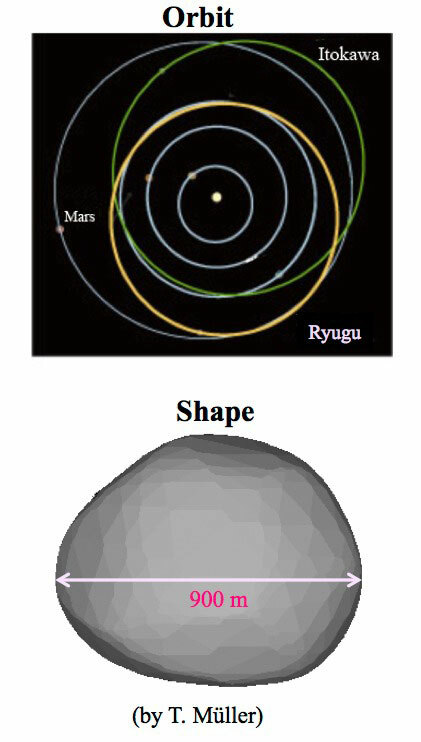 The size of Ryugu is estimated as 900m and it approach Earth closely (Fig.6). Therefore, Ryugu is another realistic candidate that will collide to Earth. Is the structure a rubble pile again like Itokawa? Hayabusa2 will give us the answer to this question. Another interesting attempt of Hayabusa2 is its impactor. Hayabusa2 has an impactor on board, and it will be released near the surface of Ryugu. The impactor will explode a few hundred meters above the surface of Ryugu and a lump of copper (2kg) will hit the surface at the speed of 2 km/s. Then we can create a small crater there. The purpose of this experiment is to get the sub-surface material. From the point of spaceguard, this is the exactly the same idea of the kinetic impactor. Of course the impactor of Hayabusa2 is quite small so we cannot change the orbit of asteroids. But I think this is a very interesting experiment for spaceguard, too. In fact, in the early planning phase of Hayabusa2, we were discussing to have a much larger impactor. It was one spacecraft. 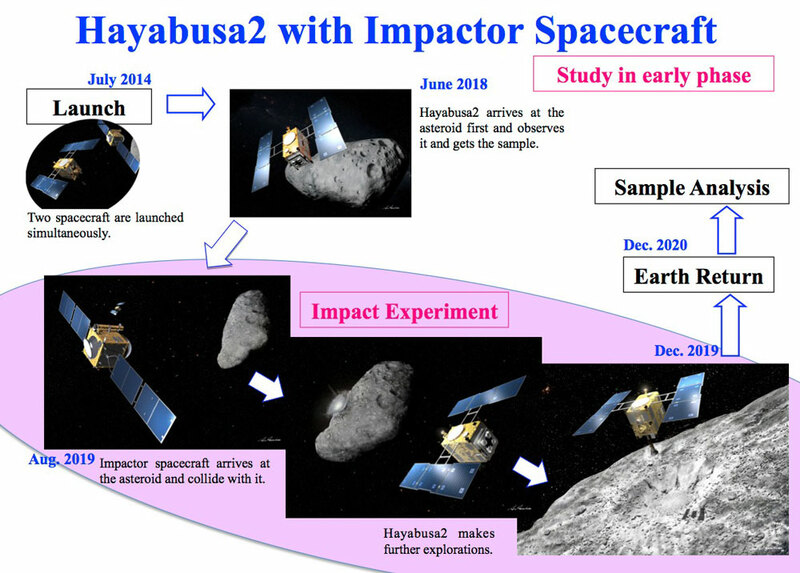 Our idea was that Hayabusa2 and the impactor spacecraft would launched at the same time by the same launcher, and the impactor spacecraft would hit Ryugu after Hayabusa2 would observe it and get the sample from it (Fig.7). This is the similar idea that is now discussed as AIDA mission by ESA and NASA. In this case, we cannot change the orbit of Ryugu largely because Ryugu is too large to change its orbit by such a small spacecraft. But our analysis shows that such impactor spacecraft will be effective to change the orbit of asteroids in the size of 60 m. This is the similar size of the body that impacted at Tunguska in 1908. This scenario was studied in the early phase of the planning Hayabusa2. The principal purposes of Hayabusa and Hayabusa2 are to develop technologies for sample return from small NEOs and to study the origin and evolution of the solar system bodies and the life. In addition to these, Hayabusa and Hayabusa2 will contribute to the activities of the spaceguard.